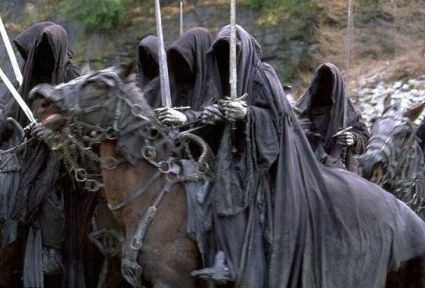 The Nazgûl (Black Speech, ‘Ring-wraith’) were the Nine who, easily corrupted and desirous of power, were enslaved by the Nine Rings of Men and became creatures of the undead, never to pass on or find rest. 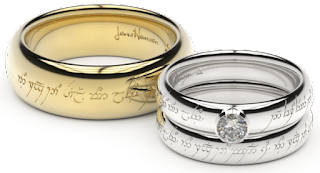 They were the chief servants of Sauron and dependent on his power through the One Ring. Wielding great power and terror, they were used by Sauron as messengers, scouts, army leaders, and to intimidate enemies. At night, their combined power was nearly as great as Gandalf’s, and they were immune to normal weapons, which would melt upon contact (they could only be wounded by weapons enchanted with special spells). When Sauron fell at the end of the Second Age, the Nazgûl were either overthrown or went into hiding; they reappeared early in the Third Age when their chief, the Lord of the Nazgûl, became the Witch-King of Angmar. Eight of them remained in the East for three hundred years more, and in TA 1600 they secretly entered Mordor, preparing the realm for Sauron, who at this time was in DolGuldur. In TA 2000, the Nazgûl, joined by their Lord, captured the city of Minas Ithil (which was from then on known as Minas Morgul) and in 2002 the palantír that was located inside. In 2941, Sauron had deserted the fortress, and ten years later three of the Nazgûl went to Dol Guldur. The Nazgûl were sent to the Shire in 3018 to search for Frodo and recover the One Ring. At this time they became known as Black Riders for the swift black horses they rode. While the Lord of the Nazgûl was successful in wounding Frodo atop Weathertop, the Hobbit still managed to elude them, and their horses were destroyed in the Ford of Bruinen. When the Nazgûl reappeared a few months later, they were mounted on flying beasts. The Nazgûl participated in the Siege of Gondor and the Battle of the Pelennor Fields. Their Lord was slain in the latter battle, but the remaining Nazgûl were not destroyed until the One Ring was unmade in the fires of Orodruin. Called in Elvish the Úlairi. Other names include the Fell Riders, the Nine Riders, the Black Wings, the Shadows, the Nine, the Nine Servants of the Lord of the Rings, and the Shriekers (by the Orcs of the Tower of Cirith Ungol). ‘Hobbit’ in 128 Channel Surround?